In 1978, Bruce enlisted in the South Dakota Army National Guard during his senior year in high school. 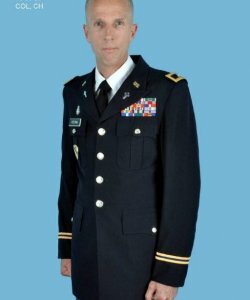 He completed Reserve Officer Training Corps at South Dakota State University and was commissioned a second lieutenant in the United States Army Reserve in May, 1982. In February, 1984 Bruce received a Regular Army commission and completed the Engineer Officer Basic Course at Fort Monmouth, New Jersey. He married Lee Ann Holbrook in May upon completion of the course. They moved to Fort Knox, Kentucky that summer for maintenance officer’s course and on to Fort Hood, Texas in August for their permanent duty assignment. Bruce left active duty in August of 1986 so he and Lee could move to College Station, Texas, to work as staff with the Campus Ministry of Cru (Campus Crusade for Christ) where he focused on ministry to cadets at Texas A&M University. In 1991 Bruce and Lee moved to Dallas where Bruce attended Dallas Theological Seminary. He completed a double master’s program (a Master’s of Christian Education and a Master’s of Biblical Studies) in 1994. He and Lee moved back to the College Station area to pursue full time ministry at Community Bible Church. He was commissioned a chaplain in the Texas Army National Guard in 1995. In 1999 Bruce began working as a civilian chaplain with Marketplace Chaplains USA. In 2002 Bruce mobilized with his Army National Guard unit for one year of active duty at Fort Sam Houston in San Antonio, Texas. He was also mobilized and deployed overseas in 2005 to Kosovo (in support of Operation Enduring Freedom) and in 2009 to Iraq (in support of Operation Iraqi Freedom). Bruce’s last assignment in the Army National Guard was as Command Chaplain, Texas Military Forces. He retired from the Texas Army National Guard in 2012. In 2012 he began serving as Command Chaplain, Texas State Guard where he served until 2016. Bruce continues to serve as a civilian chaplain with Marketplace Chaplains USA here in the Bryan/College Station area. He also volunteers as a Client Advocate at the Hope Pregnancy Center in College Station. Bruce continues to provide civilian chaplain ministry through Marketplace Chaplains USA and supports other chaplains endorsed by the Plymouth Brethren as an Associate Endorser. Bruce enjoys coaching basketball for his daughter’s home school “Aggieland Panther” basketball team and his son’s home school cross country team. He and his wife, Lee, have been married 33 years and have been homeschooling parents since 1993. They have seven children (two are married) and one grandson.